Day 4 in Montreal! Oh I have to post this picture. It is an entrance of Metro station: Station Square-Victoria. The unique gate was the replica of Paris’ metro station! Luckily, it was just close to our hotel, Le Dauphin. Our destination on that day was going to Parc Olympique and Biodome. 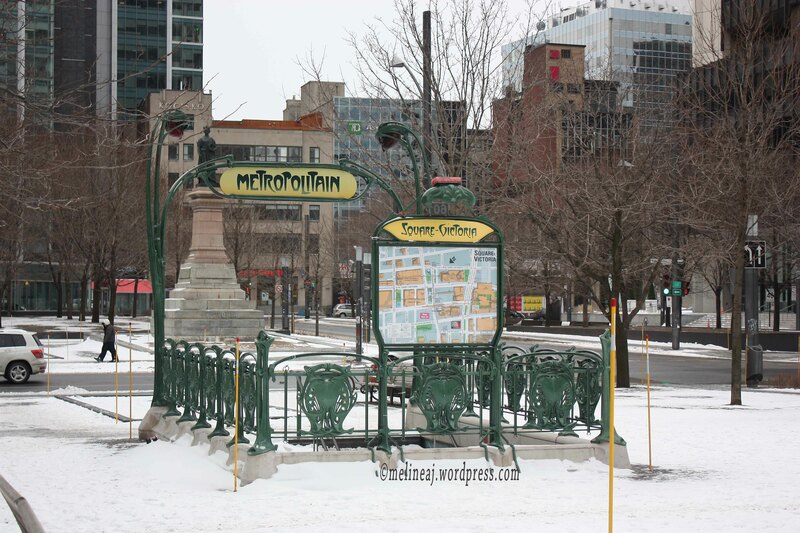 You can get here by stopping at Station Pie-IX or Station Viau, since the park spans between these two metro stations. We stopped at Station Viau and just outside the station, there was a Famous Player building – if only we had time to watch movie hehehe… Couple steps away, we saw the Biodome building. We went inside and we saw lots of parents with young children there. They were enjoying educational recreation by visiting the Rain Forest Replica. We went to the lower level of the building where there was a kid space where you can touch the preserved animal for education purposes. They also have several interesting games, like guessing the smell of various plants. We had so much fun playing around while little kids were watching us hahaha… Oh and I just had to snap a picture of the rabbit! Behind this Biodome, there is a Botanical Garden with a beautiful Japanese garden inside and a Insectarium nearby.In front of Biodome, there was a construction of what it seemed to be a Planetarium. 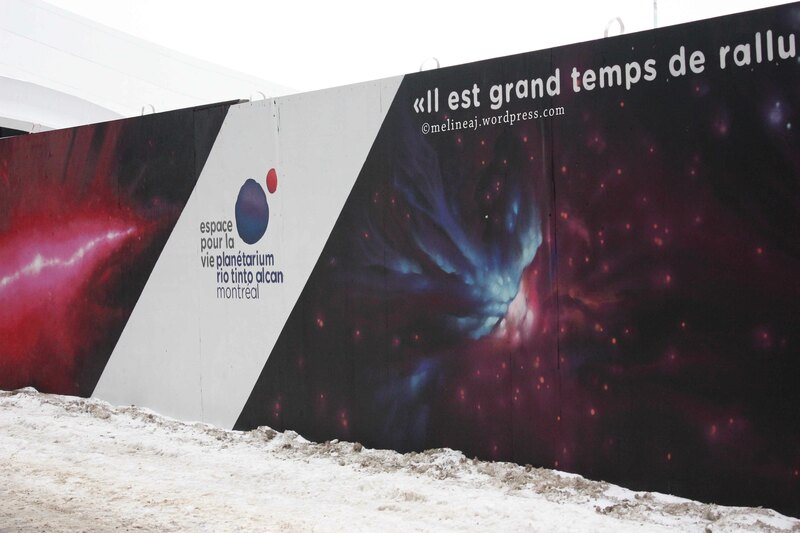 The old Montreal Planetarium was closed recently and now they’re building the updated high-tech one that will be opened in 2013: Rio Tinto Alcan Planetarium. 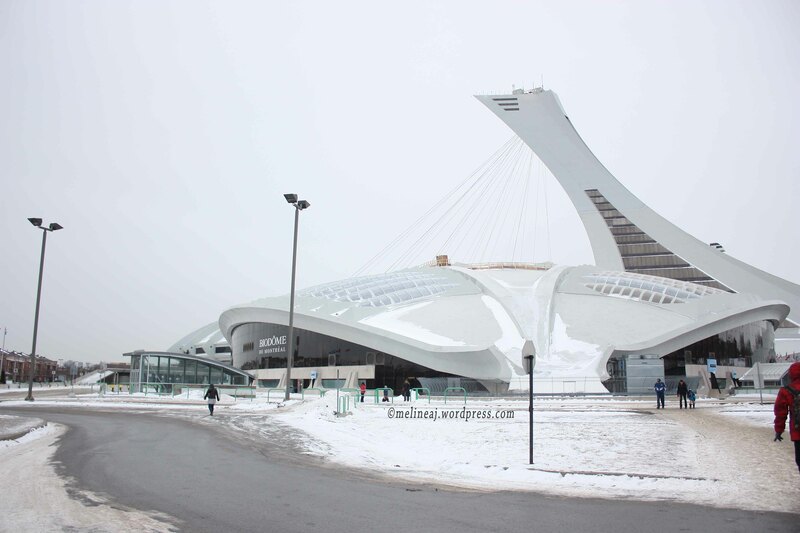 Olympic Stadium – that was built for 1976 summer Olympics – is also located in Parc Olympique. The iconic Montreal Tower has a funicular (slanted elevator) that brings tourist to see greater Montreal from the top of the tower. The ticket for funicular was $16 (cheaper if you are student). I felt the ticket was a bit expensive since there was nothing to do at the top of the tower other than viewing greater Montreal from above. We continued our adventure to visit Biosphere. Yes, don’t let the name confuses you! It’s different from Biodome. It’s a environmental museum in Parc Jean-Drapeau. The famous webbed dome is very recognizable even from afar. Parc Jean-Drapeau itself is a huge park. They have different events in summer and winter that are family oriented. We only took picture in front of the Biosphere. Then we took a 777 bus to Montreal Casino. YES! Even the bus number signifies lucky number hahaha… There was nothing special inside the casino. You have to put your jacket and oversized bag in a designated area. Also, camera is prohibited inside. We had lunch at the cafe, but I had a bad experience here. On the menu board, they said that they have Montreal smoked meat poutine and I ordered that. Apparently, the cashier might be a new staff or just unfamiliar with the menu and wrongly punched a poutine and a Montreal smoked meat sandwich. The server than called me and irritatedly explained that I couldn’t order a poutine by itself without a combo for my sandwich. Confused and a bit angry, I just changed my order to fish and chip – that was just overpriced! Yes, I was in a super bad mood after this! At the corner of Avenue Mozart E and Avenue Henri Julien, we passed a deli/ restaurant called Pizza Motta. I went in because I was curious if we could find my favorite liquor cake – since the store looked like an Italian grocery store. Inside, they have a bakery section, a ready-to-eat section with various salads and meat, and a restaurant beside the store. I ended up buying a Cannoli and a Sfogliatelle, a shell-shaped pastry with crunchy layers and custard filling. My brother bought a pork schnitzel and my fiance bought some sort of pizza combined with egg (frittata styled). Both the dessert and the savory food were good. Afterward, we walked along Boulevard Saint-Laurent. Along this strip, there were tons of small stores, especially wedding related stores like bridal, tuxedo, shoes, and favors. There were some clothing stores too alongside. Since we were still hungry, we decided to have dinner at Chinatown behind our hotel. But first, I insisted the boys to stop at Place des Art metro station. Place des Art itself is actually a performing art theatre. 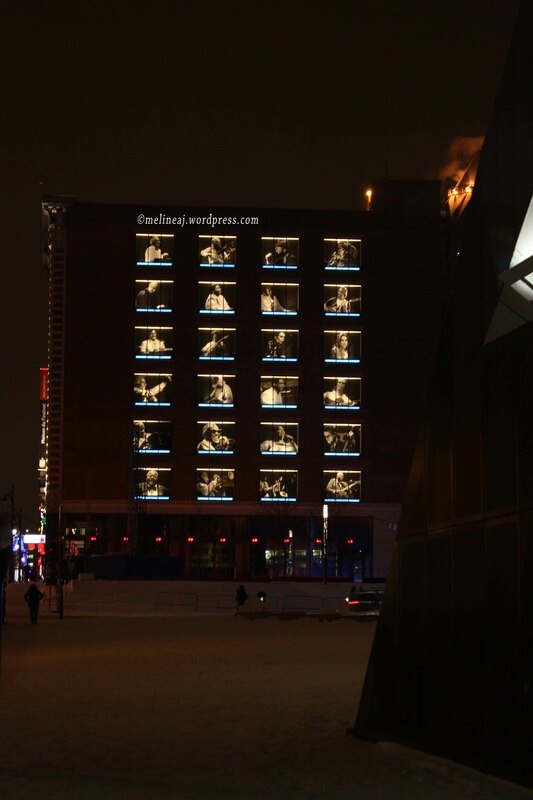 And as other art theatres out there, it was just so sophisticated and beautiful! We then walking toward Complexe Desjardins since it was nearby. It was a big mall in the downtown area (Rue Saint Catherine West). We only browsed through the store and headed to Chinatown that was only couple blocks from here. From his research, my fiance suggested us to have dinner at Restaurant Beijing, that is highly rated. It seemed like every people who craved for Chinese food in Montreal ate there that night! We had to wait for at least 30 minutes before seated. The food was nothing special, it was like any other Chinese food I’ve had in Vancouver. The fortune cookies at the end of the meal were bilingual with French and English sides! Cute! We passed Holiday Inn Select hotel that has a distinctive Chinese styled gazebo at the top of the roof. On our way back, we also passed Palais des Congres de Montreal, the Montreal convention centre building with its colorful glass windows.